Each year the weather is unpredictable, but one thing is for sure – the summer heat gets really hot! In a lot of households, air conditioning is still considered a luxury, and not something needed to survive the elevated temperatures. So what are some other ways you can keep cool this upcoming holiday? Odds are if you don’t have A/C, you at least have a fan in your house. Grab some ice water and put it in a bowl, or soak a towel. Place the bowl in front of the fan and the towel over it – either or both of these will add moisture to the air blowing in your direction, cooling you more sufficiently. Try hanging a wet sheet in front of the window if it’s a breezy day for even more cool air! 2. 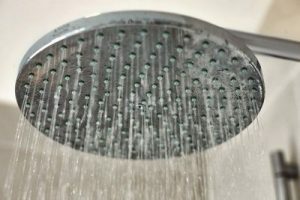 Take a cool shower! This one’s a no brainer. There’s nothing quite like the feeling of cool or cold water when your skin feels like it’s on fire. So go ahead, hop in the shower – and if you’ve got a tankless water heater like Bosch’s new Greentherm 9000, don’t even worry about that water pressure running low while you cool off. I know – you’re saying to yourself, what? Are you serious? And yes, we are – try zipping up your sheets in a plastic bag and placing them in the freezer for a bit before you go to bed. It may be a bit chilly when you first lie down, but you’ll definitely be a lot cooler, at least before the heat catches up to you again. There are two ways to go with this one. Does the construction of your house allow for an awesome cross-breeze between open windows and/or doors? If yes, open them all up! When the wind blows, you’ll enjoy a few moments of blissful air blowing through your house too. If not, consider getting blinds or curtains that completely block the sun. This will prevent extra heat from the sun’s rays (up to 40%) from entering your house and making it even hotter. Okay… we’re cheating with this one. 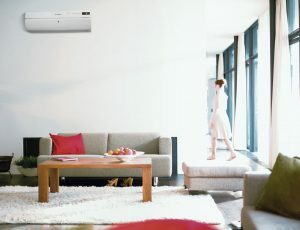 But have you checked out the new Bosch Ductless Minisplit yet? This small but powerful unit is Energy Star rated system is ideal for when you don’t want to install a lot of ductwork or endure a messy renovation. The best part? The Minisplit heats as well, so you’re set all year round. Check it out here.